Combine lime juice, sugar, pepper, oil, salt, and 1/4 cup water in a large bowl or resealable plastic bag. Stir to dissolve sugar and salt. Set aside. Place each one chicken breast half at a time between 2 large pieces of plastic wrap. Using a meat mallet, pound chicken to an even 1/4 to 1/3 inch thick. Place all four chicken breasts in the bowl or plastic bag with marinade. Turn to coat. Cover or seal and place in refrigerator for 30 minutes. Preheat a gas or charcoal grill to medium-hot. 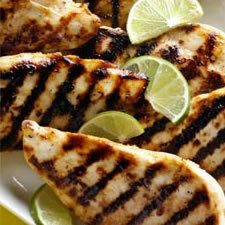 Remove chicken from marinade and grill 4 minutes each side or until cooked through. Serve hot or at room temperature. This also works just fine on a George Foreman grill. Per Serving: 239 Calories; 5g Fat (20.0% calories from fat); 1g Saturated Fat; 33g Protein; 14g Carbohydrate; 1g Dietary Fiber; 82mg Cholesterol; 627mg Sodium. Exchanges: 0 Grain(Starch); 4 1/2 Lean Meat; 0 Fruit; 1/2 Fat; 1/2 Other Carbohydrates.